So what do you think the current DIY trends are?? That’s what all the Michael’s Makers were asked – fun! There are tons out there – do you have a favorite? 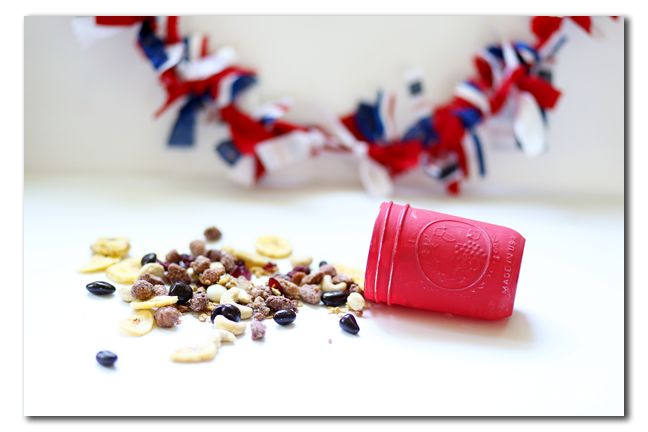 Today I’m talking one of them – mason jars! 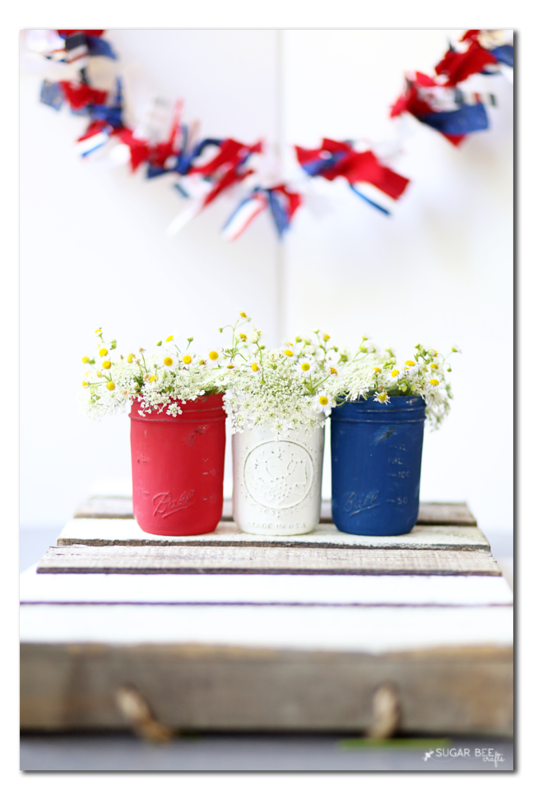 We all know mason jars have been around, but they seem to be surging in DIY circles lately. I am totally on board and will probably be using mason jars in DIY projects forever and ever. 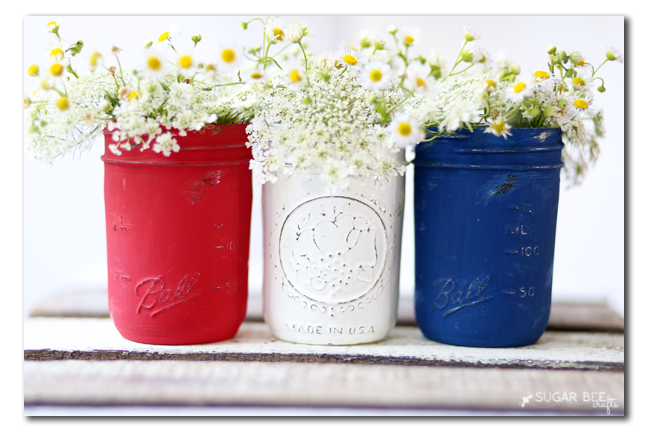 Have you ever painted and distressed a mason jar? It’s way easier than you probably think! 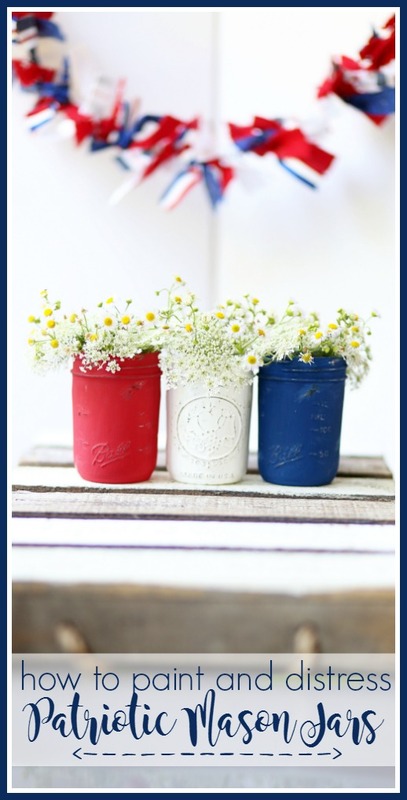 Today I’m going to walk you through how to make Distressed Patriotic Mason Jars. First, let’s talk paint. I actually used 2 kinds in this project (on accident! ), so I can compare them for you. The blue and red are chalk paint and the white is acrylic paint. I liked the chalk paint better because it goes on nice and thick, and only needed one coat. 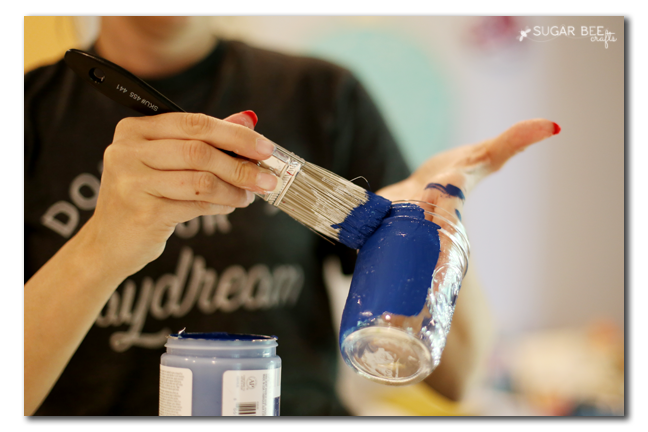 BUT, that being said, if you have acrylic craft paint on hand, you can totally use that! That’s what I used with the white jars, and it works just the same. The difference is that it doesn’t have a matte finish when dry like the chalk paint, and it’s not as thick, so I needed to paint 2 coats of white instead of 1. 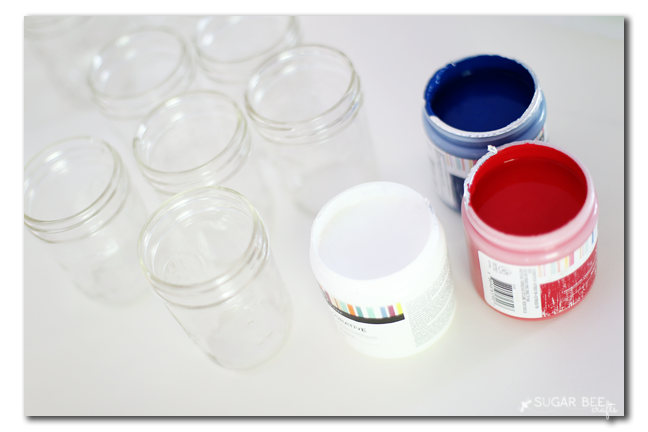 There’s not much technique needed to paint the jar – just get it nice and covered, but not so thick that it runs or drips. I didn’t paint the bottom or the inside, but I was sure to cover all of the outside, including the rim. Let dry completely. I let mine dry overnight. Next up is the sanding – take your sandpaper and just start rubbing on all the raised prints on the jar – really , that’s all there is to the distressing, just dive in and give it a try! You’ll want to sand the fruit decal thing on the back of the jar for sure, also the numbers that measure up it, the “made in usa” stamp, and of course where it says “Ball” or Kerr”. You’l also want to do the rim and the raised rings where you screw the lid on. Then after you get all of those spots, you’ll want to do just a few random patches here and there to add a little more “worn” look to your jar. 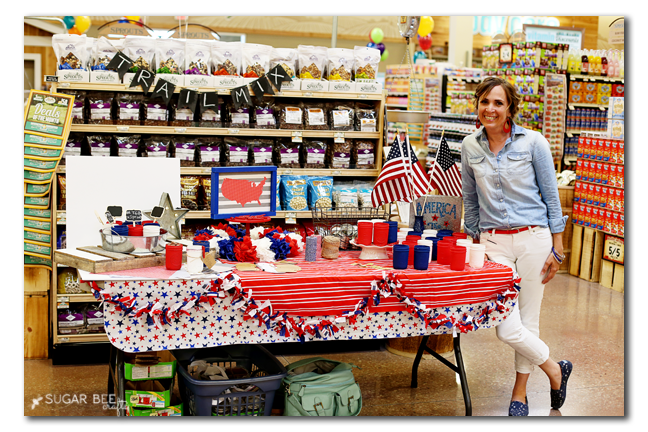 This is such a fun and easy summer project that I was able to do it at a make-and-take event for Sprouts Farmers Market. 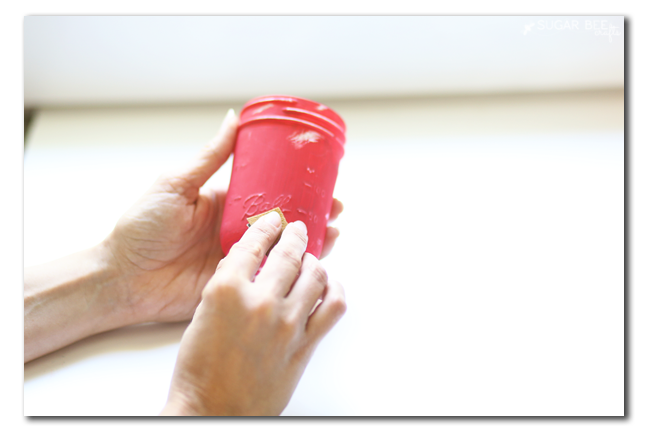 Almost everyone had never distressed a jar before and they all came away with a super cute finished project! At my station they learned the distressing technique, make their jars, filled them with trail mix from the Sprouts bulk foods section, and then were able to snap pics of their creation in a mini flat-lay station I had set up. There were several other fun stations set up as well. 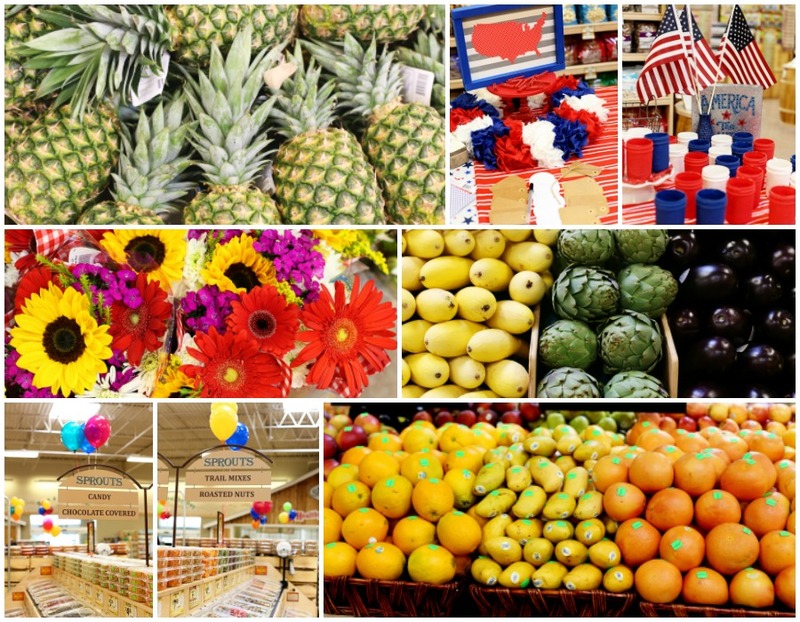 It was the pre-grand opening of the store, and everything looked AMAZING! I couldn’t stop taking pics of all the pretty produce! 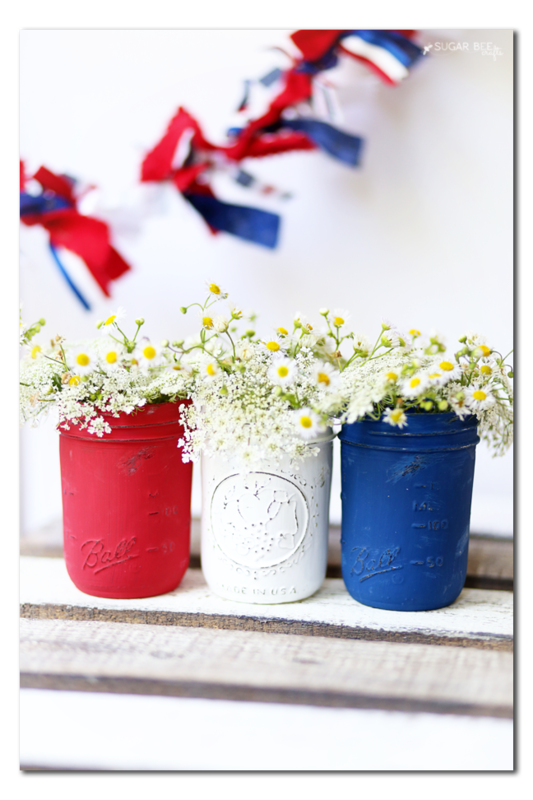 Be sure to enjoy making your Distressed Patriotic Mason Jars and Check out these other great DIY Trends from others on the Michaels Makers team!